Below is a guest post from Kids’ Dentistree , a pediatric dentist office in Richmond Hill. February is National Children’s Dental Health Month. At Kids’ Dentistree in Richmond Hill , our work revolves around educating parents and their children on good dental habits. This month, we are sharing some tips and advice on how to promote these habits at home for a lifetime of healthy smiles for your children. From toddlers to teens, Kid’s Dentistree makes going to the dentist a fun and seamless experience by building trusting relationships with parents and children at our 1101 Gandy Dancer office in Richmond Hill. 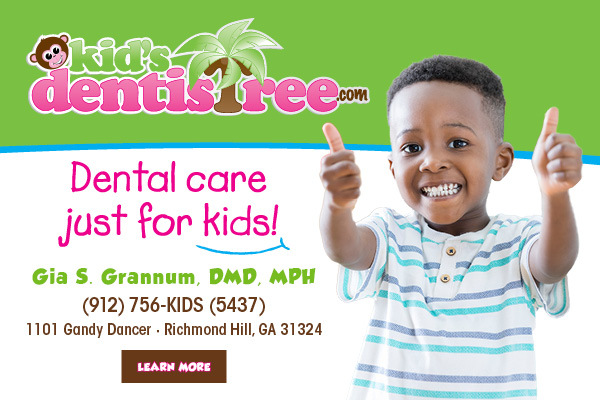 For more information, visit KidsDentistree.com or schedule an appointment today by calling the office at 912-756-5437. This entry was posted on Thursday, February 7th, 2019 at 9:48 am	and is filed under Dentists, Dentists, Health/Safety, Healthcare. You can follow any responses to this entry through the RSS 2.0 feed. Both comments and pings are currently closed.